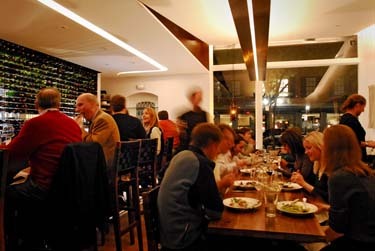 Since Opening just three years ago, Bin 26 Enoteca has received rave reviews from patrons and press alike: The Boston Globe, Boston Magazine, the Boston Phoenix and most recently Food & Wine recognized Bin 26 Enoteca for its outstanding wine list and food. Bin 26 Enoteca is a casual, yet refined restaurant and wine bar serving Italian dishes designed to complement an extensive but very approachable "wine book." Providing a true enoteca dining experience, Bin 26 Enoteca's menu offers dishes using four ingredients, a popular trend throughout Italy. Simplicity is the operative word: in the food, wine and space. Bin 26 Enoteca offers a menu designed for snacking and sharing, for a light lunch or a full meal. They use artisan-made cured meats, imported cheese, fresh seafood and vegetables from around New England as much as possible. They also boast an international wine list with over sixty wines by the glass and over two hundred wines by the bottle. Guests can simply drop in for an informal dish of pasta or formal multi-course haute cuisine.